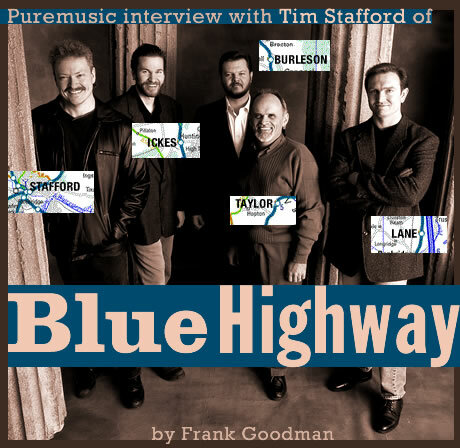 This is a long overdue interview with one of the great groups of modern Bluegrass music. Blue Highway has for all their nine records been considered at the top of the heap critically, and much admired by their musical peers and the community insiders. Their outreach is not yet what it should be into the musical world at large, but we've now joined the legions spreading the word. Most or all of the members are outstanding instrumentalists in their own right, notably the 9-time IBMA Dobro Player of the Year Rob Ickes, whose playing is mind expanding. Although we've not yet had the pleasure of seeing Blue Highway live, we have seen Ickes roll with Three Ring Circle, another supergroup with Andy Leftwich and Dave Pomeroy, at Nashville's Station Inn. But in Blue Highway, he's just another guy in the band, because they're not only all monster pickers, they're all writers of repute. Blue Highway is Shawn Lane on mandolin and vocals, Jason Burleson on banjo, guitar, mandolin, and vocals, Wayne Taylor on bass and vocals, Tim Stafford on guitar and vocals, and Rob Ickes on dobro, slide guitar, and vocals. On top of being admired by all their contemporaries, even the younger impresarios like The Infamous Stringdusters (whose upcoming record will surely constitute an interview opportunity) look up to Blue Highway in a public way and acknowledge their influence. Their vocals are remarkable, and perhaps their most arresting quality. Their sound is one born of many years together. The latest release is Through the Window of a Train, on Rounder. They cut this record right off the floor with little or no pre-production or arrangement, and it's fresh.